What is a Waste Bin Rental? A waste bin rental is simply a bin rental for waste! That’s right its also called a waste dumpster rental, waste container or waste trash bin. 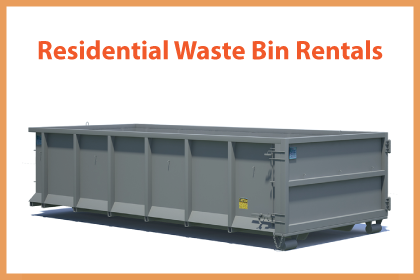 WHAT ARE WASTE BIN RENTALS? Reduce – Is there a possibility to avoid the generation of certain kinds of waste or reduce their production by changing the way certain goods and service are produced? Reuse – amongst the generated waste, are there possibilities that there may be some local businesses which would be interested in the waste as their materials for their processes? Recycle – from the generated wastes, are there materials that can be targeted for recycling? Now that you know the amount of waste generated and you already have an idea about the ones to target for recycling and reusing, the next step is to identify the most suitable waste and recycling collectors in your locality. This is also the time to designate commercial waste bins used within business for collecting different wastes targeted for recycling, reusing and those designated for the landfill so that when the collectors come, it becomes easy to for them to sort out the garbage. Reliability is very important when it comes to managing commercial waste. You should strive to work with a reliable waste and recycling collection contractor who will honor all the collection dates and times so that you are not left with lots of garbage pilling up within your commercial premises. Normally, you would be emptying the commercial waste bins into the garbage collection trucks without sorting the waste in any way. Simply order a waste bin rental online from Trash King or give us a call. We can help you choose the right trash bin for your waste and schedule a delivery date. After we deliver the waste bin, fill it up at your convenience with all your unwanted rubbish. Then give us a call and we will come to pick up the junk bin and send you a receipt for your disposal! Is it time for your business to rent commercial waste bins? We can help. Since 2005, our waste recycling company has been offering waste bins for rent to business and industrial customers looking for affordable disposal solutions that encompass ethical disposal practices, on time delivery and industry leading customer service. We have commercial bins for waste, garbage, trash, rubbish, junk and other disposal materials. 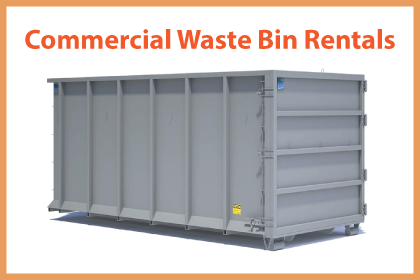 Call 604-433-5865 today and get your commercial waste bins rentals today. The first step towards effective waste management is the determination of the volume and the nature of waste generated by the business. The easiest way to do this is to carry out a visual assessment or consider the commercial waste bins if you have been using them, to give you a rough estimate of the amount of waste generated within a given duration. But now, not all wastes will be designated for the landfills and since clearly marked commercial waste bins were used for the collection. One way of increasing the efficiency in the waste management is to have a contract with your preferred company. If you choose to retain your current waste service provider, or the company responsible for collecting your commercial waste bins, you should let them know of your new waste management intentions and evaluate if their services will still be relevant with the new arrangements. The concept of reuse, recycle and recovery is being encouraged among businesses as a good strategy for reducing the amount of wastes generated by the businesses and consequently the amount of wastes that ends up in the landfills. it would be clear to know which ones will be emptied in the garbage trucks and which ones will be collected for recycling or reusing. Proper waste management for commercial businesses is imperative if the business is interested in saving money and participating in caring and nurturing the environment. Observe how the new waste management system operates vis-à-vis the old system, and make the necessary arrangements so as to make it more efficient.